Tickets for The Attic Rooftop (FKA XVI) New Years Eve 2020 are currently not on sale. This New Year's Eve, celebrate at the place New York City locals refer as 'Versailles in the sky'. The Attic Rooftop & Lounge is the French-influenced venue that infuses Miami heat, right in the middle of Manhattan. A fabulous night like New Year's Eve calls for an equally fabulous venue. Celebrate New Year’s Eve 'on top of the world' at Manhattan’s premier penthouse rooftop, The Attic Rooftop & Lounge. Experience a sleek urban oasis, one that will remind you of a luxury penthouse, somewhere in St. Tropez. Starting at 9pm, a 5 hour premium open bar, and until 11:30pm, passed hors d'oeuvres. Dance all night to the sounds of Top 40, dance, hip hop and 80's music, with a live DJ performance, playing on a state of the art sound system. Bid adieu to the old year and 'bonjour' to the brand new one at midnight, with a live NYE countdown and a complimentary champagne toast. 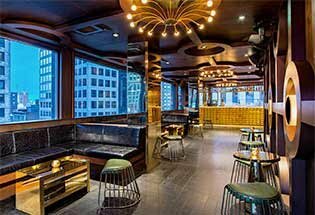 The Attic Rooftop & Lounge is the incomparable top party destination in New York City for New Year’s Eve. This bi-level rooftop lounge boasts a glass paneled pergola that shelters a lengthy beveled stone bar, while a circular bar sits prettily in the Jbird lounge. An alfresco patio, is surrounded by greenery and well-kempt hedge shrubbery, that encloses a mash-up of neo-rococo furniture. A French, Louis the XVI theme is found throughout the venues interiors. Two large projection screens are mightily impressive, but it is New York's city skyline that will fix your gaze. Located 16 stories above New York City’s bustling streets, the spectacular 360 degree panoramic views of the Hudson River and Midtown. The Attic Rooftop & Lounge mixes the hedonism of the South of France and Miami in one amazing event space. It is the perfect setting for a NYE night in the heart of Hell's Kitchen, that feels many worlds away. 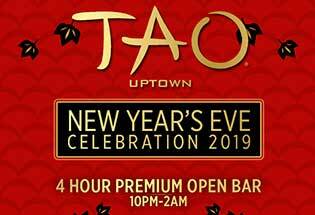 Join the beautiful crowd at The Attic Rooftop & Lounge this year in NYC, for the New Year's Eve event of the year, partying on the top of the world.